There were many burgers to choose from, so as always I asked my server which one I should get. I had noticed the mushroom burger or the Wowsa and he said it was a popular item. Well, then bring it on. My husband ordered the G-V-B-B-B-Q. Which is the burger with a Red Thistle BBQ sauce. (Red Thistle being one if their beers, and a mighty good one at that.) 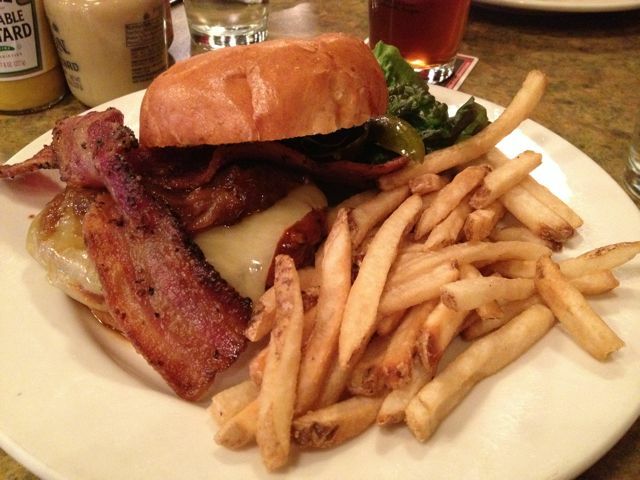 We sampled a few beers, I settled on the Red Thistle and we waited for the much anticipated burgers to arrive. The burgers were huge with tons of toppings. Mine not only had mushrooms, but blue cheese and roasted red peppers. 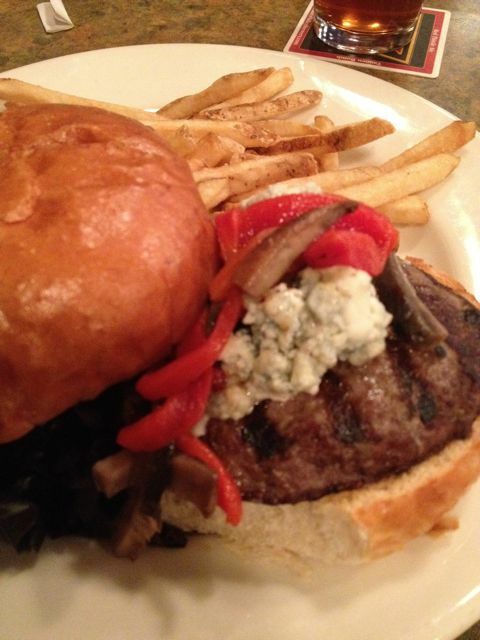 There was so much blue cheese it totally over powered the burger. I scraped it off and it was much better. The burger it’s self was just ok.
My husband liked his BBQ burger, but also agreed that there was nothing over the top special about the burgers.The toppings here are what make the burgers, and they are very creative with the toppings. Even though Killer Burger also has creative toppings, the burger itself was very good and carried lots of flavor. The toppings didn’t over power it like these did. The fries were just ok too. Neither one of us finished ours. In the end, it’s an OK burger, but it’s not THE place for a burger. I probably won’t be back. Atmosphere was nothing super special. It was huge but the tables were kind of lined up like a well done cafeteria. Pricing was very expensive in my book. Both burgers were right around $11 each. Ouch! Service was great! Our guy was helpful, informative and had a great attitude. As a matter of fact anyone one we came in contact with was very delightful. That alone can make or break an experience, so that definitely helped. They brew their own beer, so don’t pass up any of those. It’s also kid friendly and they have soda and such. We visited the downtown McMinnville location.